After following Keith hills advice i saw on a post on here I have been successfully cleaning my barrels with nulon engine cleaner . So far this has been my most successful product and i have tried many . Recently I decided to read the can to learn the ingredients consist of mostly acetone and about 1/3 methanol. At $15 a can for 500ml it is much cheaper than most rifle products but still very expensive for what it is . So I started doing a little reading. The recipe basically consists of equal parts of acetone, kero,white spirit,atf 3. I made mine about 50% acetone with the remainder made up with the other ingredients. I would like to source some methanol also to ad or make another mixture. Now this product comes cheap at about $9 per litre . This got me wondering if it would be a wise idea to make up some trays or tubes that would allow me to submerge the barrel in cleaning solution and allow it to soak for a while . Do you feel this would be a effective way to loosen the carbon ? The products selected are all safe on steel right ? The other idea was to ad ultrasonic power to the bath to really get things brewing . What do you all think of this idea ? Good or asking for trouble ? Methanol is hygroscopic and we spend time to flush it all out of our drag racing engines and model plane engines as well after the days racing. Are you sure eds red works? Methanol is not very common these days due to it being, well drunk, and causing blindness. Mentholated Spirits should be methanol but I am pretty sure it is now Ethanol which has exactly the same cleaning properties as the Methanol anyway. As for being hydroscopic well yes it is but only in concentrations above 99.6% . Once watered down to common levels say 60% or less it already has enough water in it so it is no longer hydoscopic and can be drunk more safely. Metho would be a cheaper option than methanol and much more accessible. I am in uncharted waters and don’t have much of a knowledge of chemistry. I know what works which is a solid starting point . Alternative product suggestions are appreciated. This project is not about budget. Hence using a large quantity of cleaner to submerge a barrel for a period of time resulting in less time on the brush . When I spray and patch a barrel now I always am left wondering how much cleaner is penetrating the top half of the barrel? I flip my rifle around during the process but always wonder if one part is getting more cleaning action than others ? In regards to that beaut ultrasonic cleaner you built where did you source the parts ? Or more specifically is there a special frequency or product I should be looking at ? For methanol try your nearest RC plane/car shop or club. I use to buy Shell Racing A (their brand for methanol)in 20l drums, ordered through local Shell servo. It is also major ingredient for making biodiesel so ask on those forums. John23 wrote: In regards to that beaut ultrasonic cleaner you built where did you source the parts ? I'd be interested to know how it goes cleaning barrels but haven't heard found any reports. Do you drive the transducers from one source? Bruce, re Shell Racing A. I could not find any reference to it on the Shell web site. Could it be that the name has changed? Do you have a Material Safety Data Sheet for that product? Last edited by Buckshot on Mon Jan 14, 2019 10:21 am, edited 1 time in total. 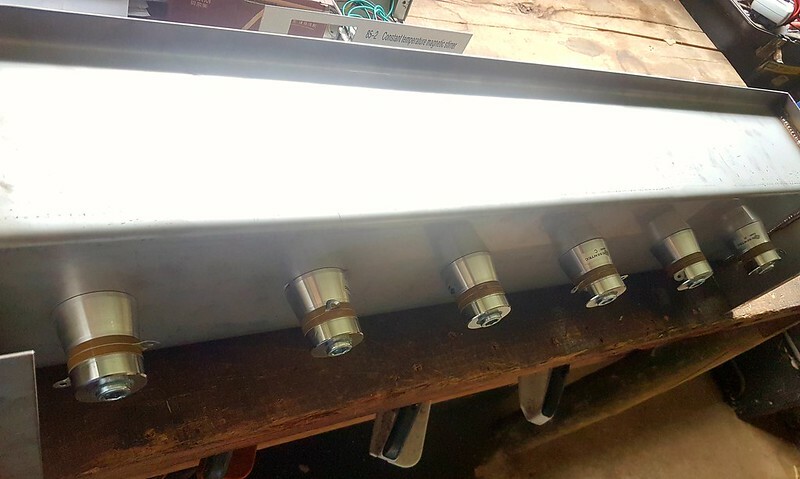 Firstly, I am not an expert in ultrasonic cleaning but I have used them in industry whilst building high vacuum assemblies for superconductors. This is just a DIY toy, the original idea being that if it works and as I am normally cleaning two barrels per week then I would be able to save time by removing most of the carbon using ultrasonics. The big concern with this approach is cavitation erosion causing the barrel to ware. This can be on a microscopic level but may be enough for the bore to become "sticky" and for pressures to increase along with increased copper fouling or (and especially over time) it can cause layers of material to be physically removed. The lower the frequency the greater the erosion! Many of the commercial ultrasonic cleaning agents for the motor industry are "safe" on stainless but will dissolve copper, lead and carbon perfect for us but possibly too good! My current thinking it that this will now be a last resort clean once barrels are badly fouled but time and experimentation will tell as I also found no reports. The only feedback I have had is David Brewster who I admire, respect and who chambers all my barrels tell me not to try it . The unit will have two drivers and a controller. I am cheating here as I already have a large (25ish litre) ultrasonic tank that I am going to use the drivers from. The tank I built plugs into the factory tank, cutting out it's transducers and powering this one instead. This gives me degas and frequency sweep functionality and a nice $$s saving for the experimental stage. Cliff Austen wrote: Bruce, re Shell Racing A. I could not find any reference to it on the Shell web site. Could it be that the name has changed? Its a few years since I bought from Shell so sounds like no longer sold. Was 98 or 99% methanol which is about as good as it gets. You need veg based oil or the right synthetic oils to mix with methanol. That is why the RC guys used castor oil originally, now synthetic oils. Methanol is CORROSIVE to Stainless Steel !! Even with an oil additive I would not soak my Barrel in it especially if I'm only trying to save $10 bucks on cleaning fluid!! If you want a cheap cleaning fluid that works try Helmar, at $17 per 500ml its cheap and does a great job on my Saums and Its all i use now! !